Every year, I always have a wonderful Christmas Holiday with my family. It will be the same again this year…the family time, the good food, and the wonderful time to just have fun. But…this year I have added the fun of seeing Clay Aiken on Broadway! It is so much fun to read all the reviews, see the pictures and read the messages on social media!! I thought that today I would share just one article with you…and of course, some wonderful pictures too. I hope you will enjoy this! 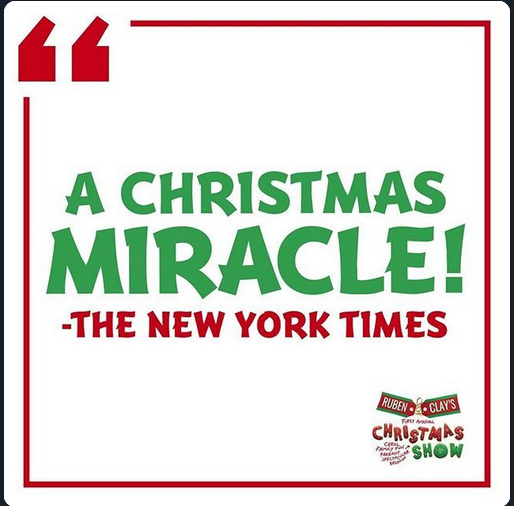 The site, Theater Mania has written many articles about Ruben & Clay’s Christmas Show. The following is fun to read! 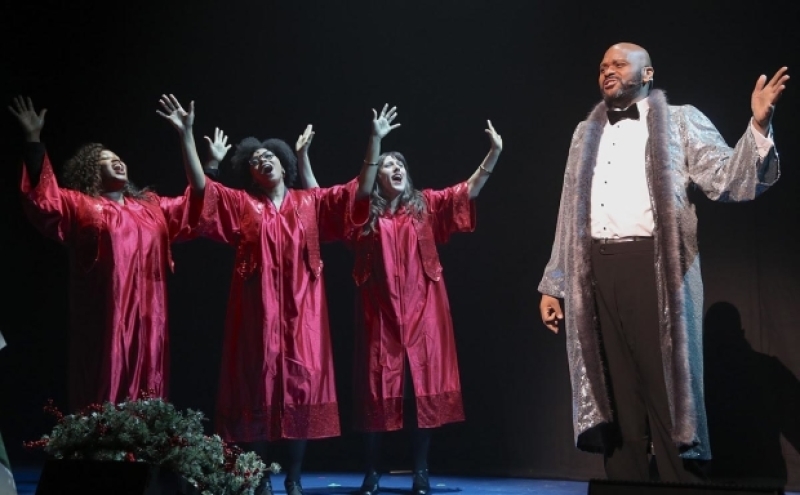 Ruben Studdard, winner of American Idol season 2, is going to save Frank Loesser’s embattled, Oscar-winning seasonal song “Baby, It’s Cold Outside” from the ash heap. 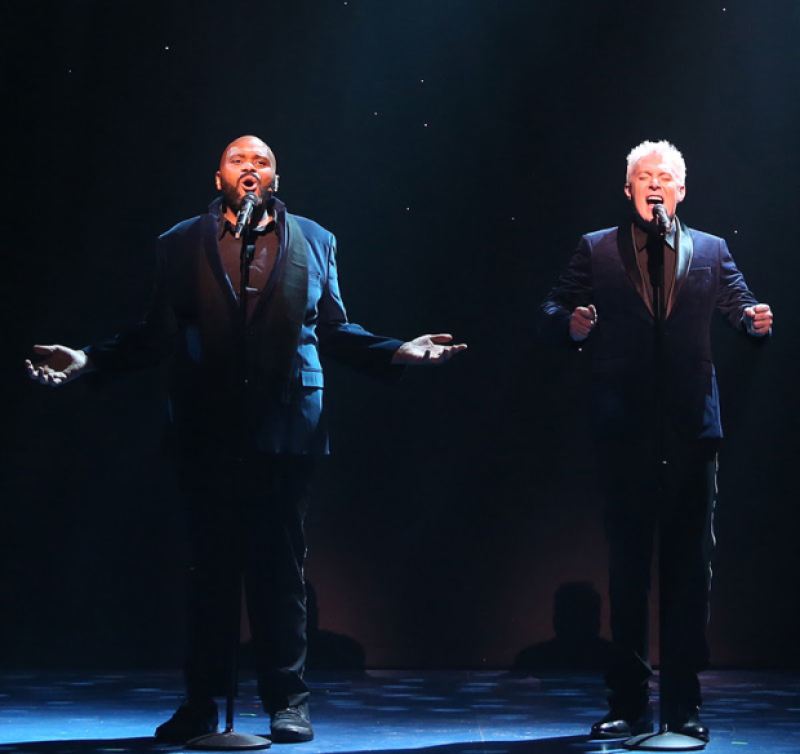 …The set-up is as follows: Studdard and Aiken, winner and runner-up (they never let us forget that), have buried the hatchet and come together to host a Christmas season variety special akin to the ones they watched growing up. What it amounts to is an evening of skits and scenes, with as many secular and spiritual Christmas songs as we could want, performed by two artists who won the hearts of 40 million people 15 years ago. 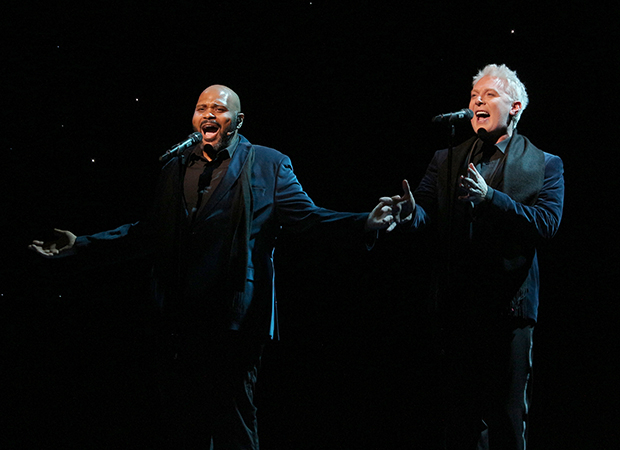 Thankfully, time has not withered their voices, and their personal performance styles complement each other onstage. 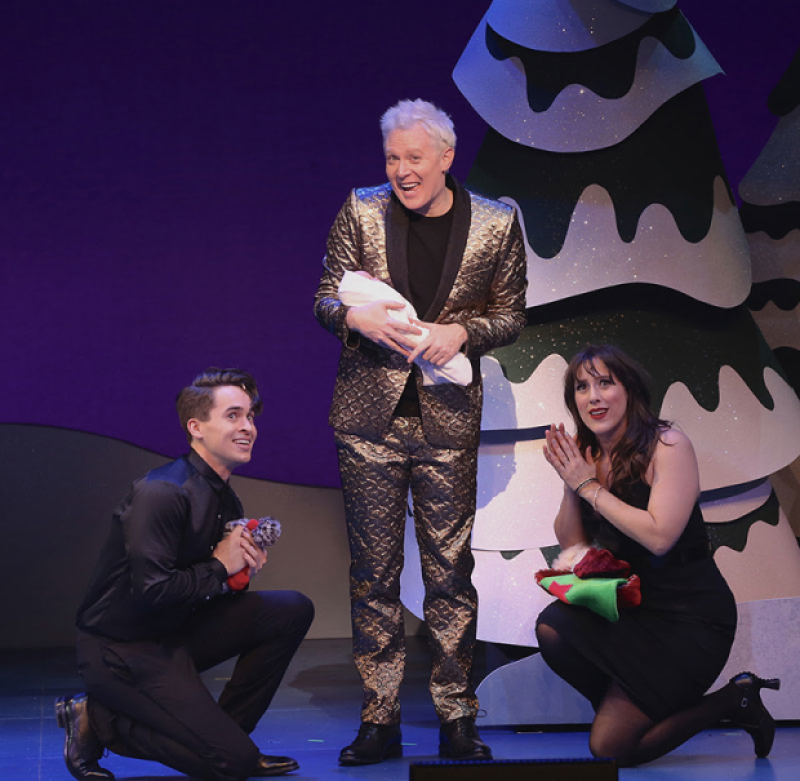 Studdard is less of an actor and not really a showman — he’s a no-bells-or-whistles, stand-and-deliver kind of performer with a velvet baritone — while Aiken’s flair for the theatrical is enough to make up for a lower register that needs a little strengthening. 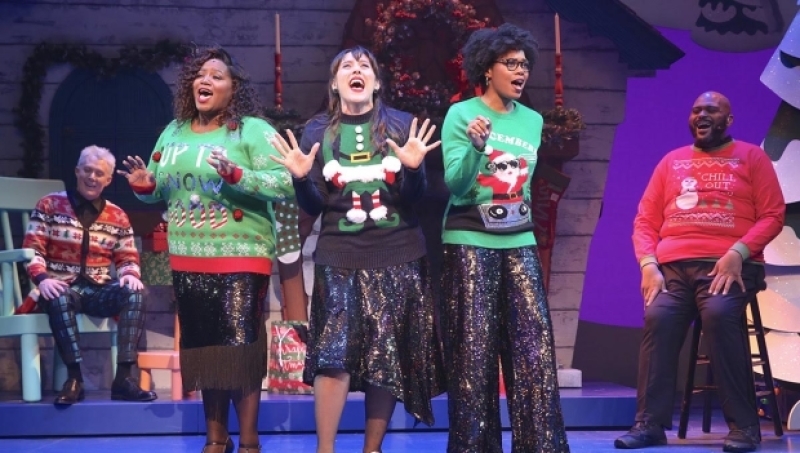 They do well by upbeat duets like “It’s Beginning to Look a Lot Like Christmas,” and have a pretty funny “can you top this”-style mashup of “Silent Night,” “Hark the Herald,” and “O Come All Ye Faithful” to open the show. Ruben: How about a chamomile tea? The entire company, not to mention the audience, is clearly smitten by these genuinely comical lyrics…. The pictures are great and I am glad that Theater Mania is supporting the show! A big thank you to TheaterMania for all the support and pictures you have posted so all can enjoy the show! Please let us know if you are able to see the show, live. We all would love to hear what you thought! Again, thank you for all the pictures and articles! I am enjoying every bit of news! Have a glorious Sunday, everyone! Thank you for the pictures and info about the show. Error: Error validating access token: Session has expired on Tuesday, 21-Aug-18 16:13:01 PDT. The current time is Thursday, 25-Apr-19 07:58:12 PDT.